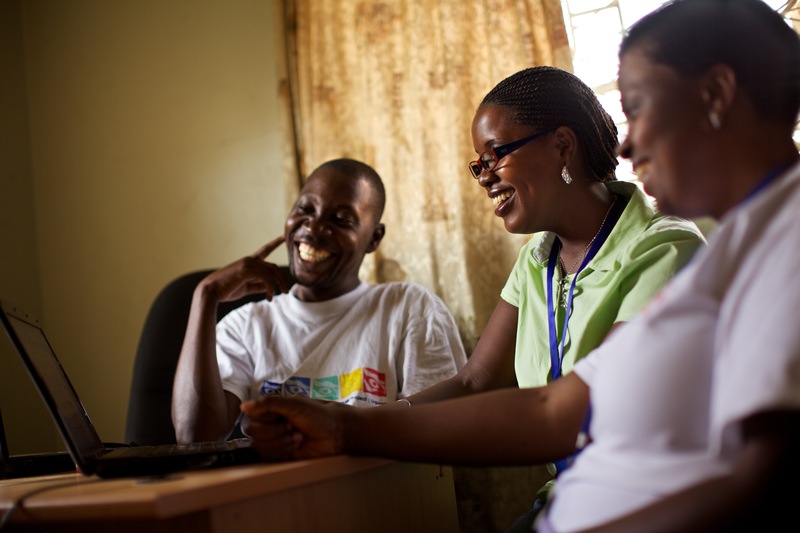 Improving the ability of 28 organizations to provide HIV services in 12 African countries. In 2005, seeking to mitigate the global AIDS crisis, the U.S. government recognized that there were many organizations that were fulfilling significant needs in their communities and would benefit from both partnership and financial support. However, funding from U.S. agencies comes with reporting and technical requirements that many small nongovernmental organizations were not prepared to meet. JSI stepped in to help these new partners with the technical assistance they needed to build capacity and systems to respond to large grants that would in turn allow them to significantly improve their services. NuPITA and NPI partner staff at a capacity development workshop. New Partners Initiative (NPI) funding began under the aegis of the President’s Emergency Plan for AIDS Relief (PEPFAR). The goal was to build capacity in local organizations that had never before received U.S.-government funding. JSI implemented two NPI technical assistance projects—one for USAID and one for the Centers for Disease Control and Prevention (CDC). Through these assignments, JSI worked with 28 new partners from Haiti and 12 countries in Africa. From its first meetings with NPI grantees, JSI’s approach recognized each group as a vibrant organization that was already serving its community. This firm recognition was appreciated by partners and helped establish trust and commitment between JSI and the grantees. JSI began each encounter with an organizational capacity assessment to better understand—and help the partners understand—the status of their management systems. Assessments were undertaken during the first year by partner staff and measured organizational performance in key areas, including financial management and board development. In the second year, a technical capacity assessment examined how services were implemented. Based on the results of these assessments, JSI provided targeted technical assistance in areas of organizational management, such as human resources and employee handbooks, policy development, and formalizing lines of authority. Recognizing the need for ongoing assistance, JSI engaged NPI advisors who worked in the new partner NGO offices and provided daily support and encouragement as systems were assessed, restructured, formalized, and implemented. What set much of JSI’s approach apart from other capacity building programs was modeling and building strong, trusting relationships and providing targeted training in U.S. agency funding requirements. The latter, in particular, ensured that the new partner NGOs had the management systems to respond to international governmental donors. JSI also conducted resource mobilization and marketing workshops for partners. These ensured that once an organization’s systems were up to standard and technical services were strengthened, the organization would be able to move into strategic marketing and position itself for bidding on and managing future funding. Each NPI partner attests to now having organizational and management systems in place as well as stronger technical programs to meet their clients’ needs. The most important result for these organizations, however, is that they are attracting further funding. To date, of the 28 organizations that received New Partner Initiative awards and JSI technical assistance, 20 have received additional funding from other donors, thus building their ability to serve their constituents for years to come.